“This is a new war and it’s only the beginning.”- Selene. The Underworld is threatened when mankind discovers the existence of the Vampire and Lycan species that have been thriving in this “alternate universe”. This situation isn’t good for them since mankind has begun a war to literally wipe both species off the face of the earth, like rats during the “Black Plague” years of 14th century Europe. Instead of the Vampires and Lycans banding together against humankind, it’s the “divide and conquer” mentality as they both go after each other as well as their common enemy. This is the hero screen used live fire Antigen Gun both used by the human guards at the Antigen Facility where Selene was being held along with multiple scenes by Selene (Kate Beckinsale) herself. 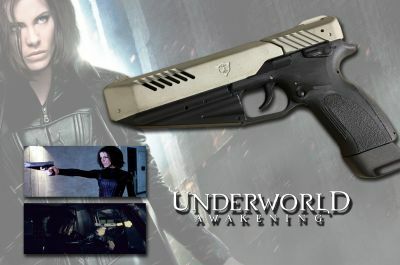 From the few custom built guns used for filming in Underworld: Awakening, this was the main one used by Selene throughout the film. The visually modified STI GP6 pistol was originally full auto and was reverted back to semi-auto once filming wrapped.